If you’ve been sizing up the new BMW X6, you might want to take a moment before signing on the dotted line, because Mercedes has just taken the wraps off a sporty coupé-styled SUV of its own. The GLE Coupé won’t be going on sale until mid-2015, but Mercedes has chosen to announce it just in time for big kids to add it to their Christmas lists. And rather than simply being a curvaceous sedan on stilts with oversized tires and chunky side moldings, the company claims that the new vehicle really is a fusion between a real SUV and a sports coupé and a big one at that. The car is 4.9m long, 2m wide and 1.7m tall. 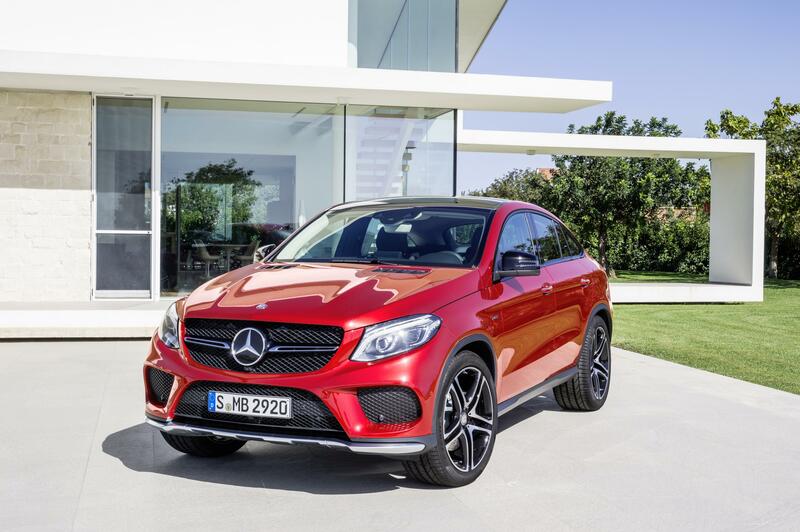 The GLE Coupé comes with permanent four-wheel-drive as standard and a nine-speed automatic transmission, plus a host of electronic handling and stability controls that should keep the car in check and behaving as intended, even in tricky situations. For instance, it gets the same active curve system that recently debuted on the company’s flagship S Class. This actively moves or tilts the body in an equal and opposite direction when cornering hard for instance or negotiating potholes — keeping the car ‘flat’ and mitigating body roll, something that’s a bigger issue in vehicles with a higher ground clearance. At launch it will be available with a V6, 3-liter turbodiesel engine or a V6 3-liter biturbo petrol engine. However, expect most interest to be focused on the AMG sport variant that will sit above the standard range but below the company’s true AMG models. In November at the LA Auto Show, Mercedes announced that it was introducing the new AMG Sport line across its range as a stepping-stone between its standard cars and its often ferocious AMG sportscars, and the GLE Coupé is the first model to get the treatment. So, go for the GLE 450 AMG Coupé and the 3-liter V6 will offer 367hp rather than the 333hp from the standard model, plus 520Nm of torque (up from 480 on the standard car). The four-wheel-drive system will also favor the rear wheels, sending 60% of the power to the back and 40% to the front for a more sporty, dynamic feel. And of course the styling will be turned up a notch, inside and out. The exterior gets a reworked front and rear apron and a different rear spoiler. It also sits on special AMG alloy wheels and the cabin gets a carbon fiber rather than wood grain trim. As such, it could make for some seriously entertaining driving. However, it’s also more than likely that just like BMW’s X6 which comes in a full-blown ‘M’ package with almost supercar levels of performance, that an equally full-blown, true AMG version of the GLE Coupé is also coming soon.